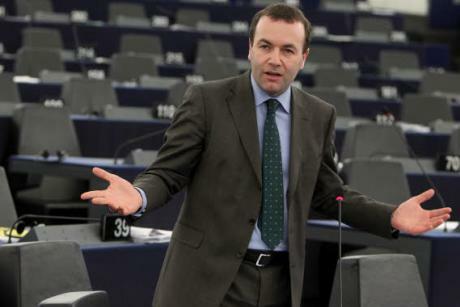 Manfred Weber (41) is the newly elected chairman of the European People’s Party (EPP), the largest political group represented in the European Parliament following the 2014 elections. He hails from Germany’s Bavarian conservative Christian Social Union (CSU). Weber spoke with EURACTIV Germany’s Dario Sarmadi. David Cameron wants the United Kingdom to leave the EU if Jean-Claude Juncker becomes president of the European Commission. What do you have to say to the British prime minister? The United Kingdom belongs in the EU – and is, itself, stronger within the community. Prime Minister Cameron knows this. I hope that he will make realistic, content-based suggestions and discuss with us. Then we will find common paths to take. Jean-Claude Juncker has gained trust among large portions of the heads of state and government and in the European Parliament. Not only heads of government are scrutinising Juncker – the tabloid press is also staking out Juncker’s private residence. Europeans are experiencing mudslinging over the election of the Commission president. Would it not be better for Juncker to just withdraw? Jean-Claude Juncker makes a strong and self-confident impression. I am certain that he will become the next Commission president. One has to wonder, after some of the spin in reporting over the last few days. This should not happen. Difficult, content-based debates are normal, but there are also limits for media which must be preserved. On the other hand, it also indicates the significance European policy has gained. As chairman of the EPP Group you are taking on a key role in the selection of the next Commission president. What will you do to help Juncker win the Commission presidency? Everyone must know that the EPP Group stands behind Jean-Claude Juncker. Without the votes of my political group, there will not be a new Commission president. Looking at the election results, what mission did Europeans give the elected MEPs? The EPP has won the elections. The voters have made us, by far, the strongest force in the European Parliament. We agreed then that Jean-Claude Juncker would become Commission president. And this is the goal I am pursuing. On the other hand, the majorities in the European Parliament also mean a mandate to cooperate with constructive powers. We will take that into consideration. In your acceptance speech in front of the EPP Group, you spoke of the EU’s “substantial problems” for the next five years. What obstacles will we be faced within the next five years? Next to the heterogeneous composition of the European Parliament, the extremists and populists are a challenge that we will aggressively address. In addition, many significant policy issues remain to be solved. We must finally return to a course of growth without straying from the path of consolidation. We must contribute to stability in our neighbourhood. But at its heart, Europe is still in a crisis over its political structure. Winning back trust is a task that can only be carried out with more democracy and more transparency in Europe. People are still dying in the Mediterranean and at the fences along the border of Melilla. Meanwhile Europe must grapple with an ageing society and a shortage of skilled workers. What changes should be made to Europe’s migration policy? We cannot purposefully avoid a debate over the waves of refugees. What is happening almost daily in and around the Mediterranean is dramatic. The signal sent by Social Democrats and the Greens, saying that the gates of Europe must simply be opened and then the problem will be solved, is false. I see a three-part solution; more help for asylum seekers from civil war-ridden countries, improved development aid for countries of origin in Africa and a more unified approach against human traffickers. By choosing you, the EPP elected a new chairman who hails from a party that conducted a Europe-critical election campaign. How does that fit together? The CSU is a party of Europe. We have shared in the burden during the entire course of integration, sometimes even boosting it, as in the construction of the euro through former Federal Finance Minister Theo Waigel. But the CSU always pointed out undesirable developments in the EU. That is what I expect of every committed European; that he see the opportunities as well as the deficits. The CSU suffered disappointing election results. What went wrong in the CSU’s election campaign? We were not able to mobilise our electorate. That has to do with the fact that we did not adequately demonstrate why the CSU is needed in Brussels and Strasbourg. This will change in the future. The Eurosceptic Alternative for Germany (AfD), on the other hand, was able to celebrate an election victory. Did the CSU give the AfD wind in its sails with its own EU-critical positions? If people are worrying about certain topics, then these issues should not be hushed up. But the people’s parties should not run after populists and extremists. The latter two may criticise loud and clear, but they do not solve any problems. We must solve the challenges we face. The AfD hopes to become a member of the political group European Conservatives and Reformists (ECR). It is already certain that the True Finns and the Danish People’s Party will join. Until now, the ECR often tipped the scales to a majority in favour of the EPP’s policies. How will you go about having to make common cause with right-wing populists? The AfD must address the question over why it wants to work together with extremist parties. During the election campaign, it always ruled out such an option. Again, this goes to show how disjointed the AfD is. I support cooperation with constructive forces in the European Parliament. Apparently that is not the case with the AfD. Yes he has to be ! And the democracy has to be respected ! Mr. Juncker candidate and won ! Cameron is hating like an schizophrenian angry kid ! It’s very sad what the “SUN” wrote against J-C Juncker ! Why do I have the feeling that the british “SUN” has been bribed by Cameron ! Worth-truly only lies from the SUN ! Cameron is worser than the worsest kind of politicians! Juncker incompetent? Far away from that ! He lead Luxembourg very well indeed through the years after the U.S. Lehman /Bubble collapse until now !! The bank secrecy (IF) has been partially “unblocked” so it’s no more the question about “unsolved”! This proves you don’t live there or maybe wants to ignore him like an anti-Juncker of Cameron.